Making it to the NHL is the ultimate dream for many young hockey players. It certainly was for Christian Fischer and Vinnie Hinostroza, who grew up five minutes away from each other in the Chicago suburbs. They even joked about one day playing on the same team. That seemed like a pipedream until their hometown Blackhawks pulled the trigger on a summer blockbuster trade that sent Hinostroza heading to the Arizona desert where he has been reunited with his childhood friend and teammate. "Never in our lives did we ever believe we'd be playing in the NHL on the same team together," said Fischer, who is wrapping up his third season with the Arizona Coyotes. "I have countless stories of Vinnie and I getting in trouble with our dads. I have pictures on vacation with his family. I was with him when he got the call that he was traded here. It's crazy how it all worked out." Ironically, they once again live five minutes apart in Scottsdale, where they are living out those hockey dreams that first took root as members of the Chicago Mission youth hockey organization. Even more farfetched is that two other former Mission players-Nick Schmaltz and Christian Dvorak-have joined them in the Valley of the Sun. In addition, Ryan Hartman and William Nylander, who played on the same line as Schmaltz and Dvorak growing up, are also playing in the NHL. In the youth hockey world, the Mission is considered one of the premier youth hockey programs in the country and a perennial contender at the USA Hockey Tier I National Championships. And when it comes to launching NHL dreams, few programs can match the Mission's success. While all four players chose different routes on their path to the pros-Dvorak and Fischer opted to play in the Ontario Hockey League while Hinostroza and Schmaltz chose the college route-they are quick to credit what they learned as youngsters for laying the foundation on which their NHL dreams have been built. Schmaltz, who is from Madison, Wis., drove more than two hours each way to practice and to play for the Mission, but says that the skill development he achieved during his time with the Mission was worth every mile and minute spent in a car. "I think it was just a great development path for me as far as playing against better competition and under some great coaches [who] taught me my style of game now," Schmaltz said. Much of the credit goes to the vision of several individuals who have made it their objective to create a top-notch organization with an eye toward the development of both male and female players. One of them is long-time hockey director Gino Cavallini, a former NHL player who prides himself on developing not only great hockey players but outstanding people as well. At last count, seven former Mission players are now plying what they learned from Cavallini at the NHL level. On the women's side, numerous Mission alumni have represented the U.S. in international competition, including Megan Bozek and Kendall Coyne Schofield, who have skated in multiple Olympic Winter Games. "What I do is 365 days a year. This is my hobby, my passion and my livelihood. I enjoy every minute of it," Cavallini told NHL.com. "I'm able to give back and develop these kids. It's rewarding to watch them get the call from Junior hockey and college, and ultimately turn pro." 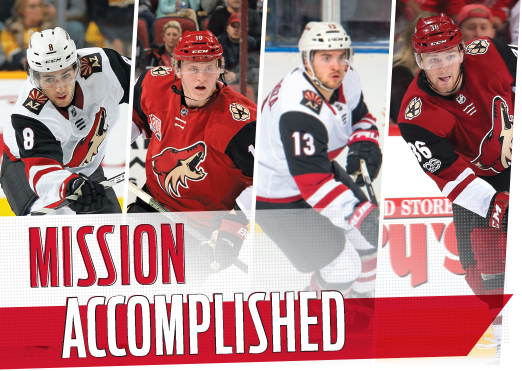 Another key cog in the Mission machine is Anders Sorensen, the organization's director of player development, who coached all four Coyotes players during their time with the program. Now that they're all in The Show, he's like a proud parent. "It's good to see the boys together again. It's ironic to see them all on the same team, but I know they enjoy each others company and love playing together, so it worked out really well." Every summer, they return home and train at the same gym, checking in with old friends on how things are going with their NHL teams. Sorensen does his part to stay in touch with many former players. When they return to their old stomping grounds in the summer, he's there to train and work out with them. It's that mindset that helped push the players to get where they are today, and the players have never forgotten it. "The Mission has done a tremendous job the past couple of years producing NHL caliber players," Fischer said. "You don't see that very often from a youth organization... Sorensen is a huge part of that success." For most, their hockey journey is a long and winding road that will take them far from family and friends. Somehow, though, these four have found their way back together on the same team, and for now, they're enjoying the full circle their friendship and hockey journey have taken. "I picked up a couple of years ago how small the hockey world can be. There's always a connection with someone," Fischer said. "Obviously with the guys here it's special. We grew up together, now we're back together, we hang out all the time, and it's kind of like being home." Taylor Sedona Clark covers the NHL and NWHL for SB Nation.